Bombers InterchangeMichael Hurley off due to an injury. Tigers InterchangeBrett Deledio off due to an injury. Tonight we come together, to celebrate our heritage, survival and identity and we honour some of the heroes who have paved the way forward for our people. Aunty Joy Murphy, Senior Elder of the Wurundjeri people, the freshwater people and the traditional custodians of this land, welcomes each of the senior elders from the five clans of the Kulin Nations. Aunty Joy is accompanied by warrior, Craig Murphy, who cleanses the land for this years Dreamtime with smoke and fire. Dreamtimers, thank you for being with us on this special night. Welcome to Dreamtime at the 'G for the feature clash of Indigenous Round: Richmond v Essendon. The crowd is suitably massive and the expectation is enormous. Stay tuned for the opening bounce. Late change for the Tigers. Brandon Ellis, who suffered leather poisoning last week against Melbourne, has been replaced by small forward Robin Nahas. The Bombers are as named. 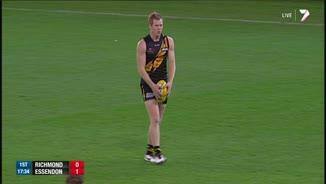 The substitute for Richmond is speedster Matt White, while for Essendon, the zippy Jake Melksham dons the green vest. Look for the lines to be broken late in the game. The Tigers have been fancied on a number of big occasions this season but have not delivered, while the Bombers slipped up badly last week. Intriguing contest but the smart money says Essendon. Welcome to Country and welcome to this epic Round 9 fixture. The players are taking their positions. The buildup has been September-esque. Let's hope the footy can deliver! Welcome to MCG for the Richmond v Essendon Round 9 clash. ESSENDON has arrested what threatened to become a mid-season slump with an impressive 29-point win over Richmond in Saturday night's Dreamtime at the 'G match. In front of an electric, finals-like crowd of 84,234, Brownlow medallist Jobe Watson starred and led his team to an important 13.13 (91) to 9.8 (62) win. Essendon had to hang on without Michael Hurley in the second half, with the key forward substituted out at the main break after he rolled his left ankle late in the second quarter. Hurley, who briefly returned to the ground in an attempt to play on, sat out the second half nursing the same ankle that sidelined him for the Anzac Day clash against Collingwood one month ago. 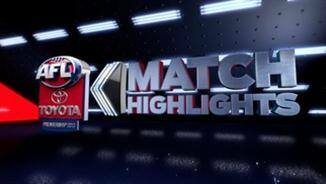 It was a significant win for the 7-2 Bombers, who had lost back-to-back matches against Geelong and the Brisbane Lions but are now firmly entrenched in the top four. Richmond, which now has its spot in the top eight under threat at 5-4, was left to ponder another loss on the big stage against top opposition. 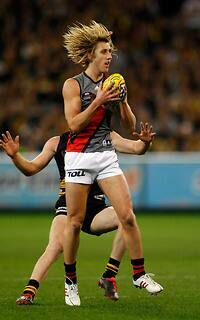 Watson was brilliant for the victors, finishing with 28 possessions and three goals and winning the Yiooken Award as best-on-ground..
David Zaharakis (18 and two) and Brent Stanton (38 and one) were also at the forefront for the Bombers, while half-back Michael Hibberd (29 and one) continued his strong season. Heath Hocking was deployed to Richmond game-breaker Brett Deledio and kept the dangerous Tiger to 17 touches and little influence. Coach James Hird praised his players' resilience after another trying week at the club that saw chief executive Ian Robson resign amid the ongoing investigations into the club's supplements program. 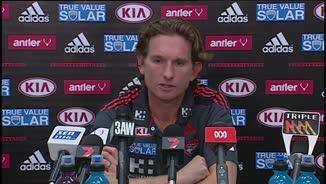 "The players are incredible," Hird said post-match. "It doesn't matter what gets thrown at them they keep jumping up. 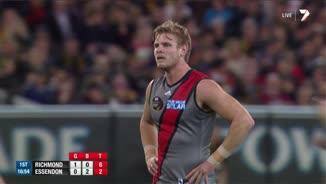 "I thought tonight was as well as an Essendon team has defended for a long time. "It showed the team valued defence, considered it important and wanted to go and show the opposition they weren't going to let them score." The Bombers, who won the midfield battles convincingly, out-tackled the Tigers 60-49, despite winning more of the football, and held Richmond to its lowest score this season. 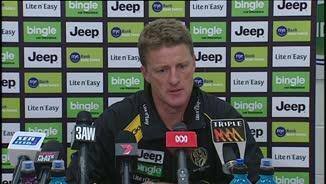 Richmond coach Damien Hardwick said the final margin flattered the Tigers. "It was 29 points, [but] it felt like a 10-goal ballgame at half-time," he said. "We couldn't get the game under control at any stage. "Finally we started to get some handball overlap [in the last quarter], but it was too little, too late. The game was well and truly over by that stage. "We just couldn't get it up and going. We'll go and have a look at the tape and find out why." The Bombers made their break in the second term after a careful start that saw both teams determined to hang on to possession. The Bombers, who won the midfield battled convincingly, made their break in the second term after a careful start that saw both teams determined to hang on to possession. Zaharakis kick-started a run of five unanswered goals, converting twice from long range, while Watson pushed forward and tormented the Tigers. The Bombers' tackling pressure was frenetic and by half time they converted their defensive efforts into scoreboard pressure, taking a 20-point lead into the main break. The Tigers attempted to spark their midfield early in the third term by injecting substitute Matt White into the game for tall forward Ty Vickery, but it was to no avail. With Brandon Ellis, who had 39 possessions last week, withdrawn pre-game with hamstring soreness, the Richmond midfield was already handicapped and there were few winners in the yellow and black. Alex Rance and Troy Chaplin battled hard in defence, while Shaun Grigg ran all night to finish with 27 disposals.